Click on a small image to enlarge it. 801-787-1668. 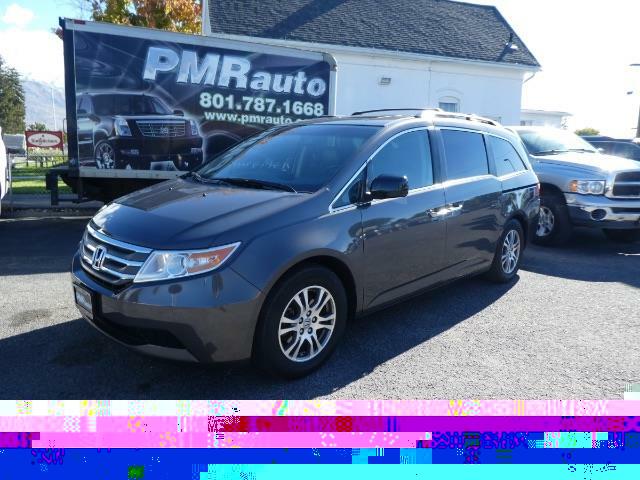 2012 Honda Odyssey EX-L. Clean Title. Leather, Heated Seats, Power Sunroof, Backup Camera and much more. Full Features Include: Traction Control, Stability Control, ABS (4-Wheel), Keyless Entry, Air Conditioning, Air Conditioning, Rear, Power Windows, Power Door Locks, Cruise Control, Power Steering, Tilt & Telescoping Wheel, AM/FM Stereo, MP3 (Multi Disc), XM Satellite, Bluetooth Wireless, Backup Camera, Dual Air Bags, Side Air Bags, F&R Head Curtain Air Bags, Heated Seats, Dual Power Seats, Leather, 8-Passenger Seating, Third Row Seat, Moon Roof, Privacy Glass, Daytime Running Lights, Power Sliding Doors, Alloy Wheels. The complete CARFAX vehicle history report is also available. Actually enjoy the car-buying experience and let us show you why so many of our customers recommend us to their Friends and Family. Price listed is INTERNET PRICE ONLY. Tell us you saw it on the Net. PMR Auto -- RIDE IN STYLE. Vehicle has a certified, clean & clear title. Prospective buyers are welcome to perform a pre-purchase mechanical inspection. We make every effort to present information that is accurate. However, it is based on data provided by the vehicle manufacturer and/or other sources and therefore exact configuration, color, specifications &amp; accessories should be used as a guide only and are not guaranteed. We are not liable for any inaccuracies, claims or losses of any nature. Inventory is subject to prior sale and prices are subject to change without notice and cannot be combined with any other offer(s). The price for listed vehicles as equipped does not include other charges such as: License, Title, Registration Fees, State or Local Taxes, Smog Fees, Credit Investigation, Optional Credit Insurance, Physical Damage of Liability Insurance, Delivery Fees, Finance and/or documentation Fees. Any and all differences must be addressed prior to the sale of this vehicle. The purchaser or prospective purchaser should verify with the Seller the accuracy of all the information listed within this ad.